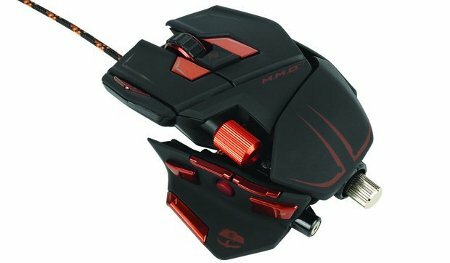 I have always maintained that gamers are extremely serious people when it comes to the type of games that they play alongside the hardware they use – and just in case you have been in the market for a new gaming mouse, perhaps you might want to consider the Cyborg M.M.O.7 gaming mouse which Mad Catz has started to ship. Targeting the PC and Mac platforms, it also picked up a CES 2012 Innovations Award nomination in the process, where it was specially designed for use with MMO (Massively Multi-player Online) software. Just so you know what you are getting into with the Cyborg M.M.O.7 Gaming Mouse, here is a quick recap of what it carries. For starters, it offers a DPI range from 25dpi to 6400dpi (in 25dpi increments), being able to detect acceleration up to 50G, and has a dynamic polling rate of up to 1000Hz. Not only that, it can has a tracking speed of up to 6m/sec, and boasts PTFE “slick” feet so that you will never, ever have to miss another shot again. Round it off with a gold plated connector, a braided USB cable and LED colors for each mode, and you have more or less got a winner for $129.99 a pop.